When I first started culinary school we made lovely bread in class that had cheese baked inside it and also sprinkled on top. I tried making it at home and overproofed the rolls; they came out too big and the wrong texture. Since I got Legion, though, I've only been making the same basic bread recipe every week with just minor modifications. 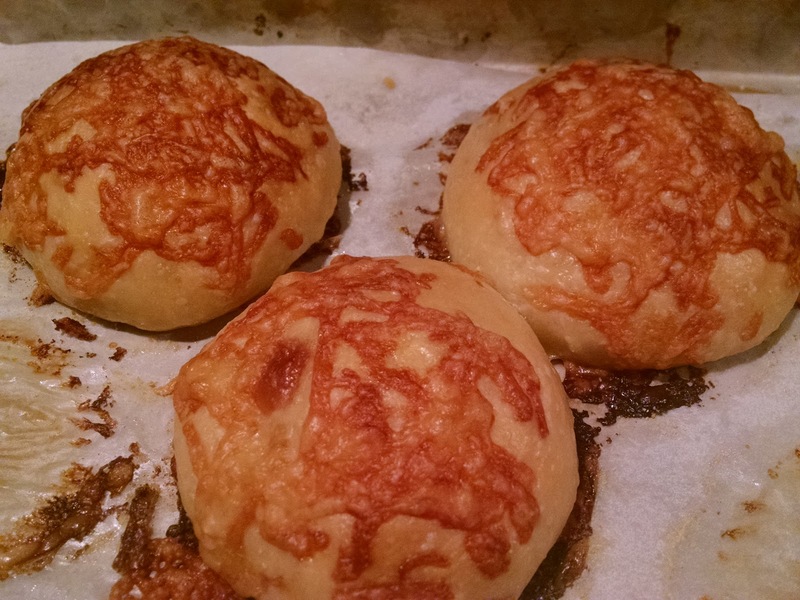 In an effort to experiment a little, I decided to try to make that cheese bread again, but using Legion instead of packaged yeast. What I did was start with 8 ounces of starter and subtracted 4 ounces of flour and 4 ounces of liquid from the recipe. This dough was very soft and sticky and so different from the bread I've been making. I've forgotten what it was like! I probably added a little too much liquid as I did add another ounce of milk while mixing. (Hey, note to self, don't do that!) Regardless, the dough fermented and proofed appropriately and the rolls came out really well. I think that was a reasonable approach to adjusting the formula and, for an experiment, I'm pleased with the results. Also today I made a half batch of salsa verde. The link to the recipe doesn't work anymore so I had to find it again. Here's the new link. This made two cups of salsa. I'm hoping the farm share has more tomatoes and tomatillos so I can make more salsa in the next few weeks! Last night for dinner I made up a recipe for ramen: for the broth I combined 1 pint each of duck and chicken stock, 1 pint water, 2 T. red miso paste, one egg, some ginger and garlic scapes, plus 1 T. sesame oil. Separately I cooked some Vietnamese noodles which were similar to ramen noodles (and all I had in the house). 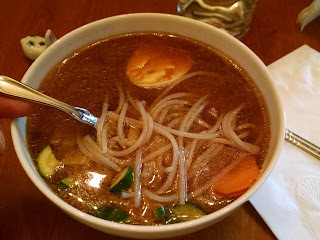 When the noodles were done they were served in a bowl with the broth and topped with a hard boiled egg, thinly sliced garlic scape (no scallions handy), blanched carrot slices and zucchini chunks. It was wonderful.